Kneading bread dough [writes author Bethany Moncel] is a practice that dates back thousands of years. But why do bread makers put so much time and energy into the practice? The answer lies in the proteins contained within flour, which provide strength and structure to the bread dough. Wheat flour contains two proteins, gliadin and glutenin, which combine form gluten. When bread dough is first mixed together, these proteins are mangled and knotted together in no particular order. As bread dough is kneaded, these proteins line up and strands of gluten form to create a matrix within the bread dough. This matrix creates strength and structure, which traps gasses and allows the dough to rise. Unlike pastries, bread is improved by handling. You knead your dough until you can’t do it any longer; you return it to the rising bowl and let it rise, and then you punch it down and knead it some more. 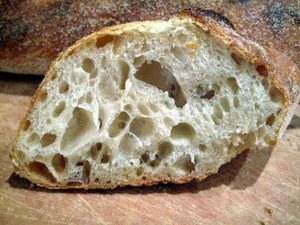 The more you work at kneading a yeast-risen bread dough, the finer its structure becomes. Making bread is a construction project, like building a house. One thing we know for certain about Jesus is that he knew the Hebrew scriptures very well. So I’m absolutely sure he knew the construction project story from today’s lesson in the Book of Proverbs, in which the personification of Wisdom . . . Earlier this week, a colleague of mine shared some thoughts for a sermon he was writing for a funeral, and his opening words made me think of our Old Testament lesson. “In the house we build out of our lives,” he wrote, “we live in many, many rooms.” Wisdom building her house and hewing her seven pillars and the work of building structure into the bread Wisdom and Jesus offer came immediately to my mind. I wondered what the seven pillars of Wisdom’s house might be and if they might help us better to understand the bread which Jesus gives for the life of the world. So I did some research to see of there was any general agreement what those seven pillars are. There is a lot of scholarship about that; however, there is no general agreement. Here are some suggestions, though, for what they might be. The number seven generally denotes perfection; it is the covenant number, expressive of harmony and unity generally, the signature of holiness and blessing, completeness and rest. So in the Apocalypse the whole Church is represented by the number of seven Churches. Wisdom’s house is said to be thus founded because of its perfection and adaptability to all states of men. But doubtless there is a reference to the sevenfold gifts of the Holy Spirit, which rested upon the Christ, and which are the support and strength of the Church, being symbolized by the seven-branched candlestick in the temple. The seven gifts of the Holy Spirit, of course, are those enumerated by various of the Church Fathers on the basis of some verses from the 11th Chapter of Isaiah. They are: wisdom, understanding, counsel, fortitude, knowledge, piety, and fear of the Lord. Still other commentators look to a verse in the Letter of James which reads, “The wisdom from above is first pure, then peaceable, gentle, willing to yield, full of mercy and good fruits, without a trace of partiality or hypocrisy.” On the basis of this verse, these commentators argue that the first or central pillar, carrying more weight than the others, is purity. The other six, then, are peaceableness, gentleness, reasonableness, helpfulness, humility, and sincerity. Another approach is that of Presbyterian pastor Todd B. Jones who in a sermon entitled Successful Living suggested that the pillars of Wisdom are trust in God, integrity, preparedness, perseverence, discretion, healthy relationship, and generosity. What are the seven pillars which Wisdom set up when she built her house (Prov. 9:1)? Columns, we should say, and not pillars, in order to secure in English the meaning of the author. For the house of Wisdom is the literary edifice, Proverbs 1-9; and the seven columns with which it is provided are seven poems of uniform length which extend through Chapters 2 to 7. Chapters 1 and 8-9 are the framework or setting within which these carefully wrought columns stand. My own thought was that the seven columns might be the seven heavenly virtues of Christian tradition: the four classical cardinal virtues of prudence, justice, temperance, and courage, and the three theological virtues of faith, hope, and charity which are depicted in the stained glass windows of our own church building. There are seven letters in that word, one for each of the pillars: R-E-S-P-E-C-T. Perhaps that’s all that’s needed for the foundation of the house of Wisdom, respect. Respect for God, respect for one another, respect for those we love and for those we don’t love, respect for society, respect for the world around us, respect for the dignity of every human being. Just a little bit . . . .
My point in giving you all these possibilities for the meaning of the pillars upholding the house of Wisdom is not that one or another is correct, not that you should adopt one or another understanding, but rather that the houses we build out of our lives, as my friend David put it, like the house of Wisdom, must have a foundation, and any one of these understandings can give us guidance as we do that building. The Roman philosopher emperor Marcus Aurelius wrote, “You must build up your life action by action . . . acting with justice, self-control, and wisdom.” We can act with any of the lists of values writers have assigned the pillars of Wisdom’s house. Just as one kneads the flour and water and yeast of bread dough to create the structure of bread, we work with these foundational elements, however we conceive of them, to create the structures of our lives. My grandmother once cautioned me never to bake (or, indeed, to cook anything) when angry; my anger, she said, would infect the food I was preparing and ruin it. In the novel Like Water for Chocolate, the principal character Tita is a young woman required by family tradition to remain unmarried and stay home to cook for and take care of her mother; she is prevented from building a life of her own. She seethes with anger and rebellion, and finds that, indeed, her emotions enter her cooking. She expresses her suppressed feelings and emotions through her cooking and has the magical ability to send her emotions through the food she prepares into those who consume it. We do that as we build our lives; as if we were making bread, we knead the foundational elements of whatever pillars our lives are built on into the structure of our existence. We hope they are the pillars of the house of Wisdom, however we conceive them to be, but let’s be honest . . . we are human beings and sometimes the foundations of our lives, like the foundations of many homes, are faulty. They aren’t made entirely of purity and prudence and self-control and justice. As much as we would hope to avoid it, we are like the suppressed Tita and we knead into the structure of our lives, as she does into her food, our negative thoughts and emotions, such things as anger and rebellion, envy and disrespect. The bread of our lives is not the house of Wisdom, nor even the bread she offers at her feast; if we are honest, we have to admit that it is often a misshapen and distasteful loaf, and even when it is as good as we can make it, we know it won’t last forever. Like our ancestors, we eat of this bread, and we die. But here stands Jesus, the Wisdom of God incarnate, calling us as Lady Wisdom calls in the poem from the Book of Proverbs, “Come, eat of my bread and drink of the wine I have mixed;” “those who eat my flesh and drink my blood have eternal life, and I will raise them up on the last day.” In place of our bread with all its faults, Jesus offers his; in place of the imperfect lives we build, Jesus offers his. Lady Wisdom in today’s Old Testament lesson is engaged in a construction project, building a house on a foundation of seven pillars, creating a menu and crafting a meal, offering bread and wine to those who pass by. Her construction project reminds us of that important aspect of bread, the central metaphor of Jesus self-offering, its strength and structure. Why do bread makers put so much time and energy into kneading dough? The answer lies in the flour proteins which provide strength and structure to the bread. Why do we put so much time and energy into building our lives? Because, like bakers working their dough, we knead structure into our lives as best we can. Why does Jesus put so much time and energy and even his own flesh and blood into building up his church? Because we need (pardon the pun) the structure that Jesus offers. Just as he lives because of the living Father who sent him, so we have strength and structure and life because of Jesus. Amen. This homily was offered by the Rev. Dr. C. Eric Funston on the Thirteenth Sunday after Pentecost, August 19, 2018, to the people of St. Paul’s Episcopal Church, Medina, Ohio, where Fr. Funston is rector. The lessons used for the service are Proverbs 9:1-6; Psalm 34:9-14; Ephesians 5:15-20; and St. John 6:51-58. These lessons can be found at The Lectionary Page.